You’re lucky, today we wrote our first science report of the mission. You’ll have the chance to see our first results ! The attached piece is the graphs of our first week on water monitoring. 1. Microbiological water analysis (Aquapad) : I have done 3 series of 3/4 1 mL aquapads since the beginning of the mission. The number of bacteriological colonies is higher than the sanitary criteria (100 UFC) but lower than the infectious limit (300 UFC). As the water we extract in Hanksville is without a doubt adapted to drinking, maybe the bacterias proliferate in the tank as it is exposed to the sun all day. 2. Water Monitoring : For now, our way of monitoring our water consomption is way more efficient than last year Supaero Crew’s (Crew 189). Nevertheless the system can still be improved. We have a new method to do the dishes that is more economical. See attached PDF for numbers. 3. 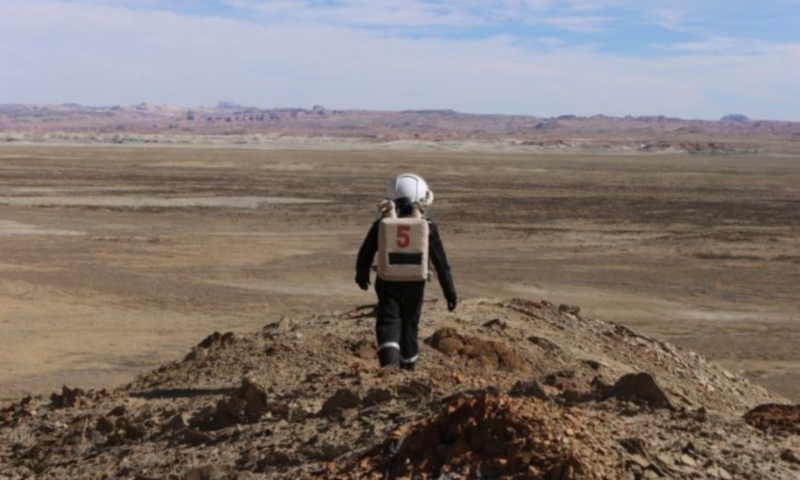 Simulation space suit : It was brought to MDRS to be compared to the actual suits and the conditions of the simulation. They were able to put into light the imperfections of their suit but also its advantages and they oriented the future development process. 4. EVA tracker app : We are still facing issues. 5. Music for plants : The biggest issue is an equipment one : the UV lamp the Greenhab Officer brought didn’t work due to the differences in US and EU electrical system. He used the UV lamp that was in the science Dome which is not powerful enough. The experiment may not work as planned. 6. The human factors experiments won’t be described here in order to avoid bias. Purpose of EVA: This EVA was supposed to allow us to do some maintenance on the LOAC (battery level and rain protection). In addition to that, we wanted to go on a long hike to compare the actual space suits to the one our crew is developing. Narrative: After the 5 minute depressurization, we checked the water levels and the rovers’ batteries. At 9:16 am the engineering check was over and we took the rovers to go to the LOAC location. We changed the battery and improved the water protection on the LOAC. When that job was done, at 9:26, we didn’t take the rovers immediately because we saw a car moving ahead of us, probably the CNN filming crew. After asking the hab to sort the issue with Atila, we decided to change our plans and go to the north. We stopped at 9:46 am at 518545/4253080 to go for an exploration walk. We found the landscape really interesting and were surprised that the canyon we walked in wasn’t named on the map. There was a light shower but it was so short that we didn’t have time to go back to the rovers and I decided that it wasn’t necessary to go back to the hab. When we got to the rovers (10:46) we decided to keep exploring around Reservoir because CNN filming crew was still in the hab. At 11:05 we took the rovers back to Pouce corner and when the HabComm Team assured us the CNN filming crew was gone, we went back to the hab and entered the airlock. Sol Activity Summary : We got up a little after 07:00 am to begin the work out. The sun wasn’t shining this morning, but we were feeling great. At 09:00 am we were almost ready for EVA, the new LOAC battery was fully charged. Outside the ground was pretty dry, we went straight to the weather station to do a quick maintenance. After that we went north instead of going to kissing camels, CNN’s filming crew was still arriving, so we didn’t want to hold anyone up. After 10 minutes of driving we stopped to start our exploration. We discovered that the camera had no SD card, so we couldn’t take any pictures. We walked east towards a canyon that wasn’t noted on the map. After a little walking it started raining lightly, so by precaution we decided to go back to the rovers in case the rain didn’t stop, but after 4-5 minutes it did stop. We took the rovers to go to reservoir dam, to explore it. When the CNN filming crew left the Hab we went back to the Hab. During that time the two others were in the science dome. This afternoon I was interviewed by CNN, the rest of the crew worked on their experiments. In the afternoon the wind started to go up a lot, we noticed that it had tiped over the weather station and the LOAC, we need to fix it quickly. Look ahead plan : We hope to be able to go on EVA tomorrow to fix the LOAC, but the weather doesn’t look like it wants us to go out. Sol Activity Summary : We got up a little after 07:00 am to begin the work out. The sun wasn’t shining this morning, but we were feeling great. At 09:00 am we were almost ready for EVA, the new LOAC battery was fully charged. Outside the ground was pretty dry, we went straight to the weather station to do a quick maintenance. After that we went north instead of going to kissing camels, The filming crew was still arriving, so we didn’t want to delay anyone. After 10 minutes of driving we stopped to start our exploration. We discovered that the camera had no SD card, so we couldn’t take any pictures. We walked east towards a canyon that wasn’t noted on the map. After a little walking it started raining lightly, so by precaution we decided to go back to the rovers in case the rain didn’t stop, but after 4-5 minutes it did stop. We took the rovers to go to reservoir dam, to explore it. When the CNN filming crew left the Hab we went back to the Hab. During that time the two others were in the science dome. This afternoon I was interviewed by CNN, the rest of the crew worked on their experiments. In the afternoon the wind started to go up a lot, we noticed that it had tipped over the weather station and the LOAC, we need to fix it quickly.